The Veho Vecto is a decent little travel speaker with plenty of appealing features, but immense sound quality is not one of them. The Veho Vecto 360 is a wireless Bluetooth speaker with a unique selling point: it's rainproof. Not a bad idea for a travel speaker to be impervious to a bit of rain, actually, so it's surprising that there aren't more out there like it. If you've not heard of Veho before, it's a UK company that's just signed a deal to become Southampton FC's new club sponsor, so you'll probably see the logo around a bit more from now on if you're a footy fan. Currently available for £80 online, the Vecto is a pretty standard proposition, offering Bluetooth streaming, line-in audio and MP3 playback via a microSD slot. It can handle calls with an internal microphone and can be tossed in a bag without fear of it falling apart. It achieves its water resistance thanks to a rubber skin which covers up all the joins that rain might try and seep through, the sneaky wetness that it is. I have problems with that rubber skin - it's very easy to start peeling it away from the chassis so I can see it becoming damaged and thus less effective over time. You'll also find that sand, fluff and dirt sticks to it very enthusiastically so it's hard to get clean once it's been out and about. Not a huge problem, but it's not ideal either. The Vecto's ports are protected from mother nature behind a flappy door, under which you'll find a USB port you can use to charge your mobile or tablet, a microSD slot for MP3 playback and a microUSB port for charging the speaker itself. You'll notice there's no 3.5mm line-in port which is really quite frustrating, but that doesn't mean you can't still set up wired playback. In the box you will find a single three-way cable with USB, microUSB and 3.5mm jack attached. I guess it's an honest attempt at a 'does it all' cable for charging and line-in combined, but I really don't see the logic in it. It means you've got to take the cable away with you instead of being able to use standard cables from other devices. Most of the time, though, you'll be using Bluetooth anyway and that all works perfectly. The NFC chip can be found right on the top of the device, so a quick tap with your Android phone and you'll be paired up and read to go. Buttons on the side are simply volume up and down, plus forward and back for track skipping. No problems there, though it's strange to see the V+ button on the left of the V-, it only makes sense when you approach from the front. I'm certain I've never see it done that way before. Sound quality on the Veho Vecto is so-so. Its dual 4W speakers don't sound tinny as such but nor are they punchy and bold. Most sound comes through in the midrange which isn't going to offend anyone but equally will not hugely impress either. It certainly doesn't have the booming presence of the Jabra Solemate, so if you want mega bass, look elsewhere. And despite the '360' monika, take note - the sound is absolutely not a 360-degree affair. The two drivers are very much forward-facing so you'll need to be front and centre to hear it at its best. The battery is certainly one of the strongest features on show here. Its 6000mAh capacity is enough to play for hours and hours while also delivering a full dose of charge to a demanding device like a (3,200mAh) Samsung Galaxy Note 3. You could charge a smaller smartphone up to four times over if you don't use it as a speaker, making it a great portable battery boost for camping trips or hikes into the wild. The large battery is a great addition, adding a much-needed phone-charging option for that last minute camping trip. 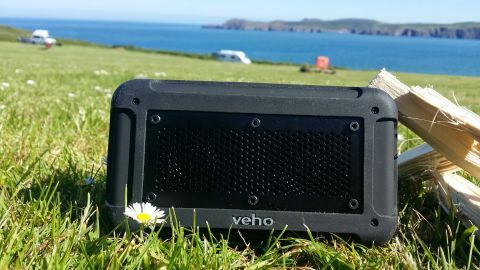 So if the Veho Vecto cost £50 or below I'd absolutely recommend it as a decent all-round Bluetooth speaker for a fair price and with the added bonus of being weather-resistant. But the problem is that it's not currently that cheap. Amazon has it at more than £100, while Firebox's price of £80 is as cheap as I could find it (26/06/14). For £80 I'd suggest there are other similar-sized devices out there that deliver similar functionality with better sound quality.